If you’ve been paying attention to the lettering world long enough, I bet you could name certain lettering artists with just one picture, like you would if someone showed you various logos from popular brands. For instance... do you recognize the authors of these three images without looking for a watermark? The artists of these gorgeous pieces are (from left to right): Molly Jacques, Lisa Congdon, and Emily McDowell. I've become so well-acquainted with the style that each of these ladies brings to their art that I feel confident I could pick their work out of a lineup any day of the week. What sets these artists apart and makes them stand out is the unique, consistent style of their lettering. It’s the thread of similarity that runs through their work and the details that feel distinctly theirs in comparison to the rest of the lettering artists you see out there. These artists didn’t just learn this unique style overnight; it likely evolved over a long period of practice, study, more practice, inspiration, more practice, observation and… you guessed it, more practice! As for you, if you want to develop a lettering style that feels uniquely yours, one that will become instantly recognizable by others, first know that it WILL take a good deal of time and a lot of repetition. Even once you feel you’ve settled into a well-developed style, as you continue to practice, you’ll keep learning and adding to what you know and it will keep enriching and evolving the art you’re creating. (That, in my opinion, is the fun part!) You’ll be able to look back across months and years of your lettering work and see how it inched forward over time. If you want a head-start though, the steps in this article will help you get a leg up in identifying what that style might be. Psst. Not quite sure what I mean by "lettering style?" SEE ALSO: An Introduction To Creating Lettering Styles With Details. Ready to start the journey of finding your own unique style? Here’s how to begin. 1.Observe and study lettering artists sharing their work online. I always think the best way to cultivate your creative voice in any medium is to start with immersing yourself in that world. Creativity is largely just a remixing and rearranging of various points of inspiration, so consider this step your inspiration gathering mission! Study and observe diverse artists on Instagram, Pinterest or bookmark their website portfolios. A few of our favorites in addition to those mentioned above are: Mary Kate McDevitt, Sean Wes, Jessica Hische, Kristen Drozdowski, and Ian Barnard. You can also follow curated accounts that pull from a variety of sources like: @TheDailyType or @TypographyInspired. Remember: you’re there to understand the nuances and details of their work and their creative voice, but the ultimate goal is to develop something all your own. Avoid following SO much inspiration that you drown out your own creative voice or that you start to compare your work to their and, even worse, get discouraged. Use the work of other artists as a motivator, not as a tool for comparison or imitation! If you notice yourself creeping into that territory, the best thing to do is distance yourself and start creating instead! 2. 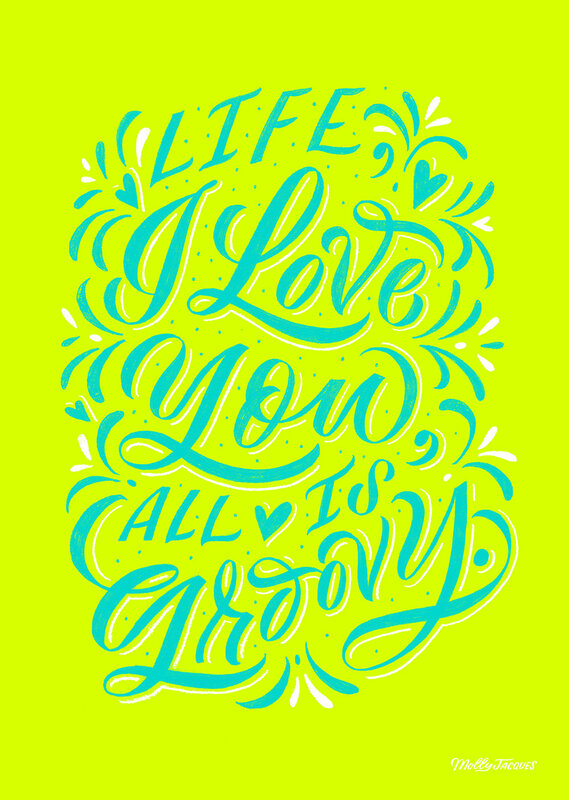 Curate a visual collection of the lettering art you really admire. Once you dive into the lettering world, you’ll want a way to keep track of what kind of pieces you really love. 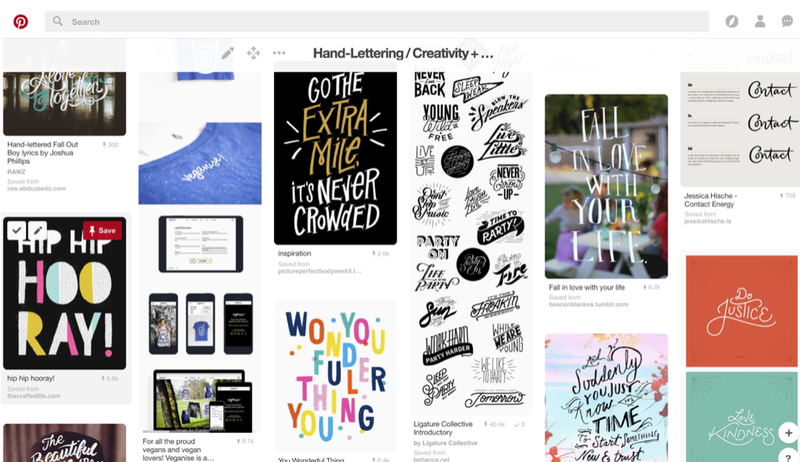 You can create a board on Pinterest, or use a folder on your computer or phone to take and save images that help you see what these lettering pieces you’re drawn to have in common. Just be careful to pull your inspiration from a large variety of influences. This will help ensure that whatever style you do develop doesn’t match or mimic another artist’s style in a way that suggests outright copying. After a while, you’ll start to notice a trend of the type of lettering that really gets you excited about your art. That’s when you can start studying them in more detail, deconstructing those pieces to see what it is you like about them. Look through font books such as Alan Kitching's A-Z of Letterpress, Retro Fonts, Script Fonts, etc. Go to font websites like DaFont, Font Squirrel, Creative Market and browse through their popular, newest or recent fonts. Check out book covers or magazine covers and see what fonts/letters grab your attention or make you want to pick them up. Pay attention to what lettering artists you find yourself looking for new work from. Notice business signs, ads, posters or packaging you catch yourself noticing when you're out and about. Are there patterns and themes throughout these letters that keep repeating? Do you like lettering that is more simple and minimal or more complex and decorative? What feelings, associations or emotions do you see across your favorite lettering pieces: Elegance and flair? Playfulness and whimsy? Fluidity and flow? Structure and ruggedness? What details in the individual letters contribute to those feelings? Do the pieces contain lots of color, a specific set of colors or are they more often black and white? Do the lettering pieces you’re drawn to stand out because of what they say? Take a note of what type of content you enjoy as you think about the kind of content you want to create. Do you like unexpected compositions or things with symmetry and balance? As I look over the similarities and patterns in these three pieces, I can see I tend to like movement and flow in the compositions, not always perfectly symmetrical or aligned but with a sense of balance, a mix of lowercase and uppercase letters, sans-serif style with occasional script and ligature details, and a simple style (not illustrative) with the emphasis being on individual letter details and high contrast black & white with color accents. I plucked out all of that from just three pieces! Imagine what you might be able to find out from an entire Pinterest board of your favorite lettering. To take that one step further, you can see certain elements of these details show up in my early lettering work, and in the work that has continued to develop over time. Developing my style wasn't about copying these other artists, it was about paying attention to what elements of their work resonated with my natural creative voice and developing those stylistic choices. Asking yourself these questions will be really helpful in giving you a place to start with your own lettering. You’ll already be way ahead of the game in developing your own style because you’ll be going off of what you already like! 4. Time to start practicing. This is where the real magic happens: repetition and consistent practice! Pluck out a few inspiration pieces/sources you’ve collected and try to replicate them. Tracing is ok and perfectly acceptable as long as you’re not selling the art piece or sharing it as your own! (That’s not cool and ultimately only hinders your ability to ultimately discover your own style.) If you do decide to share a piece you’ve traced/copied, make sure to give the artist explicit credit up front and center, though honestly I’d keep any practice copied work as your own private exercise away from social media. Also, keep in mind you’ll develop your own style quicker and understand more of how that style will look unique to you, if instead of tracing the designs and style of others, you copy the design by looking at it and observing the curves, angles, lines, color choices, etc. Go back to basics! Mix it up by practicing a hand-lettered alphabet in all uppercase and then all lowercase, all cursive, then all print. Practice making versions of the alphabet wider or thinner, taller or shorter. Pay attention to the letters or alphabet versions that make you want to tattoo it on your forehead. Toss out the ones that are not at all anything you want to create again. Style is in the details so practice making slight tweaks and changes until you land on something that feels original and authentic. One word 50 ways. Try writing just one letter or word in as many ways as you can think of and challenge yourself to get really creative! Create your own style library! Start a notebook with each page dedicated to a letter of the alphabet where you add different styles of letters you find that you really like. Practice often and consistently. Make a habit out of it. 10 or 15 minutes a day is better than an hour on Saturday, and an hour on Saturday is better than a full day of practice once a month! Just like with anything we do repeatedly, you will get more skilled more quickly with consistent effort and attention. The goal is to teach your hands (and your brain) to fall into that muscle memory! Finding your style won’t happen quickly or easily and it might not even be something you recognize right away as you have your head down practicing. One day though, you’ll look up and peer back at the volume of work you’ve created, and you’ll see a pattern or trend to your lettering that you’ll be proud of! Alright, what are you waiting for! Get to practicing! Want to learn even more hand-lettering tutorials and develop your unique hand-lettering style but don't know where to begin? FEAR NOT! THE BETTER LETTERING COURSE IS YOUR HEADSTART!